What do you call a soft drink? – Girl Gamer, Esq. What do you call a soft drink? Gamers drink soda, right? Or pop? Or Coke? 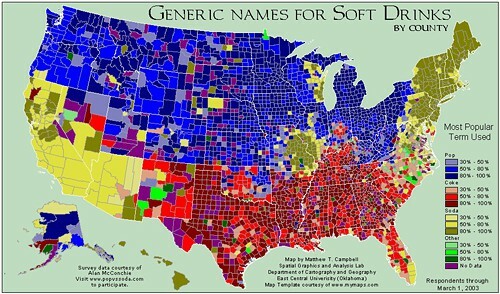 In keeping with the trademark theme of the week (roll with me here) I found this cool map of the various things we call soft drinks. If you click the photo, you can go to the actual map, which is clickable by county. I grew up in Seattle, then went to school in Southern California, so the change was weird for me.